A few weeks ago a friend from home asked if there were any races in Rochester over Veterans Day weekend. 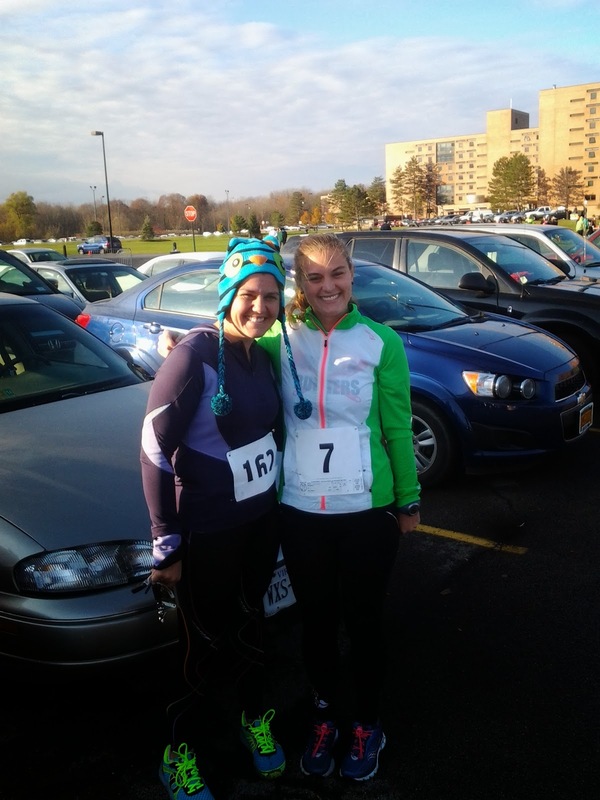 I knew that there were some trail races, but then I found that there was a 5K at a local college in Rochester. When I looked into it, I saw that it only cost $10 if you pre-registered and $15 if you did day of registration. 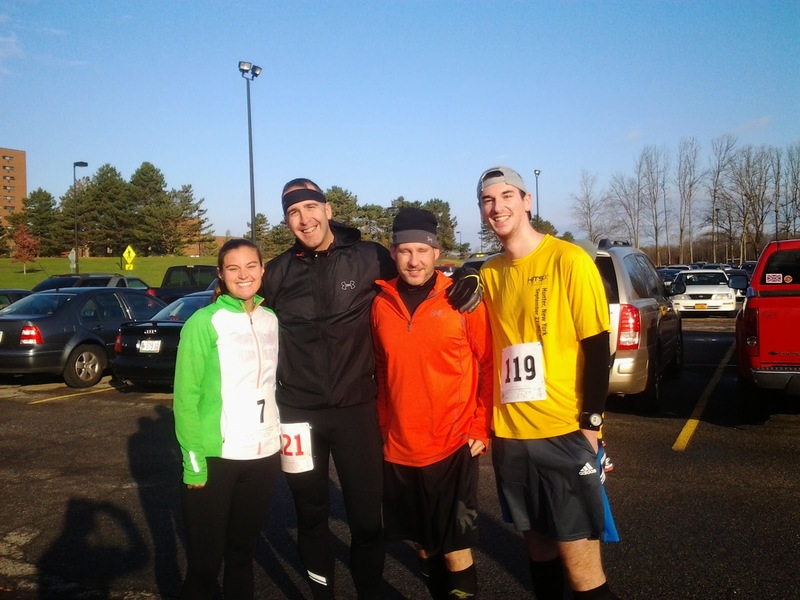 We found out that some trail running friends were also going to the race, so we decided that we would run it too! I pre-registered (Mike didn't) and then I was going back and forth on whether I wanted to race race or just run for fun. I put out a status on Facebook asking if anyone would want me to pace them during the 5K and Sarah at Mom Running on Empty jumped at the chance! Last year we had tried to run together so that I could pace her to a sub-30 5K, but it was a blizzard outside so plans changed! This time Sarah told me that she wanted to try for a sub-29 5K or at least PR (under 29:30ish). We got to RIT relatively early since Mike had to register and then we sat in our car waiting for everyone else to arrive. As we were waiting, Sarah, her husband Rob and their son pulled into a parking spot right near us! Soon, it was time to get out of the car. It was pretty cold this morning, the wind was not helping matters, and we all shivered while we took some pre-race photos. We found our #trailsroc friends and made sure we got some photos with them! Trail runners can run on roads too! Trail runners ready to go! Rob missed the trail runner group photo, so I made them take another! There was a 10K option that started at 9am (and did two loops of the course) and after the Color Guard presentation, a moment of silence and the National Anthem the first race was off and running. The 5Kers had about 15 minutes to wait and we were freezing! Amber and Greg had run to the race to cheer us on and I knew that they were going to be cold while they waited for us. Then it was our turn to start! There wasn't any chip timing, so as soon as we heard "go!" I started my watch. Sarah and I were running well and a bit faster than the intended 9:15 pace, so I slowed us down a bit and we settled in. Then her son, Danger, was running with us for a bit and started to struggle. Sarah was worrying about him running alone and almost 1 mile into the race she told me to go so she could stay with him. I felt conflicted but I went ahead. I didn't know what I was going to do, since I didn't go into the race to race but to pace, but I picked up speed. The first mile had come in at 9:09 pace. I started picking people off and we rounded the corner to run down through campus. It was really windy during the second and beginning of the third miles but I just tried to keep up a good pace. Mile 2 came in at 8:07 pace. Around mile 2 or so I saw Sarah's husband, Rob, in the distance. I decided I wanted to try to catch him and as we turned back onto the campus loop for the end of the race I got closer. Mile 3 came in at 8:08 pace. As we got close to the finish I said to Rob, "get in there!" but he didn't hear me. As I passed by him I tapped him on the back and when he saw me he started to run faster. Greg yelled to me to basically sprint to the finish and I just out ran Rob. The last little bit came in at 7:19 pace. We found everyone and I found out that Mike had unofficially PR'd (hopefully there will be official results) with a finishing time of 22:06. I had crossed the finish line in 26:19 with an average pace of 8:25, not too bad for not racing it! We saw our friends finish the 10K and then we saw Sarah and her son finish! Even though the day didn't go as planned it was still a lot of fun! I am happy that Sarah and Rob are going to be on our Seneca7 team this year. Now, I guess I have to try for a PR at our next 5K in a few weeks! Schweet! Congrats to everyone! Super windy here this weekend too. Ugh. Too bad you and Sarah were not able to run together, but glad you enjoyed your race. GREAT RUN!!! Sounds like a great weekend all around! oh cheap, I like that! I am hoping to do some trail runs in 2014 finally! Great race all around for you guys and your friends! Congrats to Mike on a new PR!